The interplay between political institutions and economic outcomes has been at the centre of economic analysis since the work of Adam Smith, and its roots can be traced as far back as ancient classical readings. Extant theoretical and empirical work analyses the role of democratic development (or reversal) in economic development, with the views and findings still rather conflicting (e.g. Acemoglu et al. 2015, cf. Ruiz Pozuelo et al. 2016). At a juncture in time when many intellectuals and policymakers, and the public at large, feel that democratic institutions might be at stake, understanding the channels through which these institutions affect economic outcomes is more essential than ever. In new research, we relate democratic development to the cost of credit to corporations, essentially providing a new channel through which democratic development plays a positive role in economic development (Delis et al. 2017). Banks, especially those involved in large and very risky corporate loans, are well-informed about the political outlook of the borrowers’ countries. As a consequence, banks might charge a risk premium on the basis of macroeconomic and political risk. This has been evident throughout the history of economic and political crises (e.g. Bekaert et al 2016). In democracies − compared to autocracies − there are more inclusive institutions and better protection of property rights, there is reduced social conflict, information flows more freely, and citizens are more financially literate. These characteristics play a central role in the functioning of financial markets in general, and in the pricing of loans in particular. We would therefore expect fundamental democratic developments working through these institutions and rights to matter also for loan rates. If democratic development plays a role in the loan-pricing models of banks, then we can hypothesise that banks will charge a lower risk premium to borrowers in countries with more developed democratic institutions. The simple correlation between democratic development, as defined by the Polity IV Project and the World Bank’s country-specific lending rates (in country-year panel data for 1984–2014), is indeed negative and statistically significant: -0.62 with a t-stat of 42.60 (see Figure 1). Also, by comparing loan terms for the few loan deals made since the recent Turkish coup d'état attempt of 15 July 2016, relative to 2016 loan deals prior to the coup, we observe a considerable increase in the mean cost of lending of around 30 basis points (Figure 2). 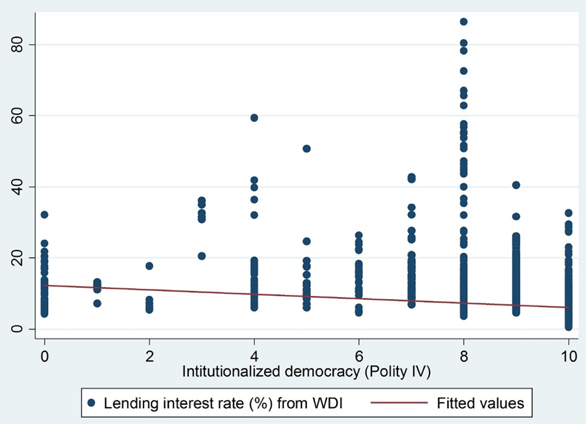 Notes: The figure reports the correlation between the institutionalised democracy index (Polity IV Project) and the aggregate lending interest rate from the World Development Indicators (WDI). Zero indicates no institutional democracy and ten indicates a maximum level of institutional democracy. The panel consists of 89 countries over 1984-2014. The slope of the regression line is -0.62 with t-stat = 42.60. Notes: The figure reports the total cost of loans (as measured from Berg et al 2016; defined in Table I) before and after the Turkish coup d'état attempt on 15 July 2016. There are 24 loan facilities before 15 July 2016 and 9 loan facilities after that date. These are conventional loan facilities in the sense that we drop all loans for which there is no conventional pricing (i.e., there is no spread) and this deletes all types of Islamic finance and very specialised credit lines. To establish causation, we resort to loan-level data and analyse the impact of democratic development in the borrowing firm’s country on the spreads of corporate loans. Specifically, we use the syndicated loan market that includes corporate loans (loan facilities) to firms from 89 countries in the 31 years between 1984 and 2014 (data from DealScan). We match these loans with accounting information for firms (Compustat) and collect, from a series of macroeconomic databases, information for all relevant institutional and economic characteristics (including various indicators of democracy) of the country in which the firm operates. saturating sets of fixed effects for lead bank (i.e. the bank setting the spreads), year, and country. In this respect, the only remaining source of endogeneity can arise from within-country time-varying unobserved variables. Second, the fielding of country fixed effects in particular yields identification from a change (advancement or reversal) in the democracy indicators. To the extent that such a change is not systematically correlated with within-country time-varying unobserved variables, our estimates are consistent and unbiased. Third, to further insulate our analysis from the possibility of such inconsistency and bias, we additionally use an instrumental variables (IV) approach. Our instrument is drawn from a recent study by Acemoglu et al. (2015) and is calculated using regional waves of democratisations and reversals (excluding the borrower’s country). Our baseline results (which come from an OLS model with fixed effects) establish that a one unit positive change in democratic development (on a zero-to-ten scale) lowers the corporate loan spread by 21 basis points. This is economically sizeable –the average loan spread in our sample is 178 basis points, implying a decrease in loan spreads by approximately 11%. The equivalent IV model yields a corresponding reduction in loan spreads by 22 basis points, and is also similar for alternative dichotomous measurements of democracy, using indicators from the Freedom House (Boix et al. 2013) and Acemoglu et al .(2015). By exploiting reversals in democratic development, we further show that reversals increase the spread of the average loan by approximately 257 basis points. Apparently, a reversal immediately poses extreme credit constraints to borrowing firms, given of course the associated political instability, and this highlights an important channel through which corporate confidence and real output are affected. We show that our results hold in a number of robustness tests and cannot be otherwise explained. Specifically, we show that democracy in the lead bank’s country (when the lead bank is based in a different country than the firm) does not affect corporate spreads. Further, there is no robust evidence of simultaneity between the effect of democracy on loan spreads and other risk-related characteristics of the loan, such as the loan amount, the use of collateral and performance pricing provisions, and the number of covenants. Thus, in democracies, banks price the risk premium through the spread and do not ask for lower spreads because of the use of loan guarantees or lower loan amounts. Our final exercise is a first step to identify the role of the constitutional components of democracy on the cost of loans and the equivalent role of perception-based civil liberties. This analysis is rougher in terms of identification of causal relationships, but provides some guidance on the potential importance of various vessels through which the effect of democracy is transmitted. From a constitutional perspective, the competitiveness of executive recruitment (mostly referring to de jure clauses on equal opportunities of all people to be elected in office) and the competitiveness of participation (reflecting whether countries have a multi-party democratic system and associated freedom of expression) are at the forefront of the effect of democracy on loan spreads. From the perception-based indicators, the most important correlates of loan spreads are information transparency, institutional quality, and protection of property rights. These findings provide clear directions for future research to further identify country-specific sources of the cost of loans and pinpoint causal effects. Our findings essentially highlight efficiency in loan pricing as an important channel through which a positive effect of democracy on economic activity can be established. In this sense, our analysis contributes to the seminal literature on the nexus between democracy and economic development (Acemoglu et al. 2015, and references therein), as it documents the comparative advantage of firms operating in democratic countries vis-à-vis those in less democratic or authoritarian countries. In turn, we expect that the beneficial effect of democratic development on the cost of loans will transmit to the real economy through higher investment spending, spending on research and development, innovation, and growth, a topic we leave for future research. Acemoglu, D, S Naidu, P Restrepo, J A Robinson (2015) “Democracy does cause growth”, working paper. Bae, K-H and V K Goyal (2009) “Creditor rights, enforcement, and bank loans”, Journal of Finance, 64: 823-860. 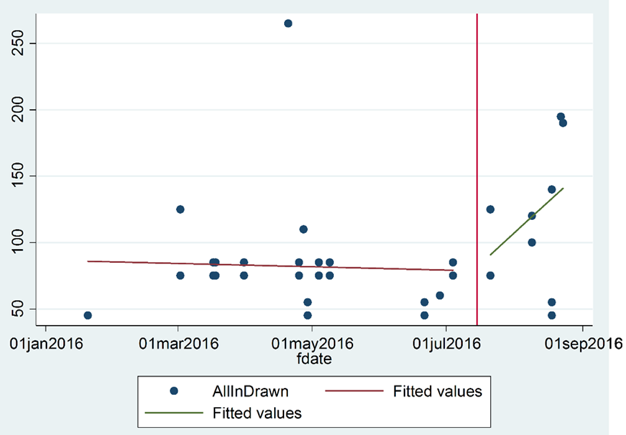 Bekaert, G, C R Harvey, C T Lundbladd and S Siegel (2016) “Political risk and international valuation”, Journal of Corporate Finance, 37: 1-23. Boix, C, M K Miller and S Rosato (2013) “A complete data set of political regimes, 1800-2007”, Comparative Political Studies, 46: 1523-1554. Delis, M, I Hasan and S Ongena (2017) “Democracy and credit: ‘Democracy doesn`t come cheap’ but at least credit to its corporations will be”, CEPR Discussion Paper 11840. Qian, J and P E Strahan (2007) “How laws and institutions shape financial contracts: The case of bank loans”, Journal of Finance, 62: 2803-2834. Ruiz Pozuelo, J, A Slipowitz and G Vuletin (2016) “Democracy does not cause growth: The importance of endogeneity argument”, IDB, Working Paper Series Nº IDB-WP-694.